The Berliner Philharmoniker, founded in 1882 as a self-governing body, has long been esteemed as one of the world’s greatest orchestras. Hans von Bülow, Arthur Nikisch and Wilhelm Furtwängler were the principal conductors who left their distinctive mark in the Berliner Philharmoniker’s early decades. In 1955 Herbert von Karajan became the orchestra’s artistic director and, in the ensuing years, worked with the musicians to develop a unique tonal quality and performing style that made the Berliner Philharmoniker famous all over the world. Claudio Abbado, chief conductor from 1989 to 2002, devised a new type of programming, with increased emphasis on contemporary works, expanded chamber recital series and operas in concert performance. He was followed by Sir Simon Rattle, who led the orchestra from September 2002 until the end of the 2017/2018 season. During his tenure, the Education Programme was initiated to ensure that the Berliner Philharmoniker reaches a wider and, especially, younger audience. In November 2007, the orchestra and its artistic director Sir Simon Rattle were appointed UNICEF Goodwill Ambassadors, the first artistic ensemble ever to represent the international children’s organisation. 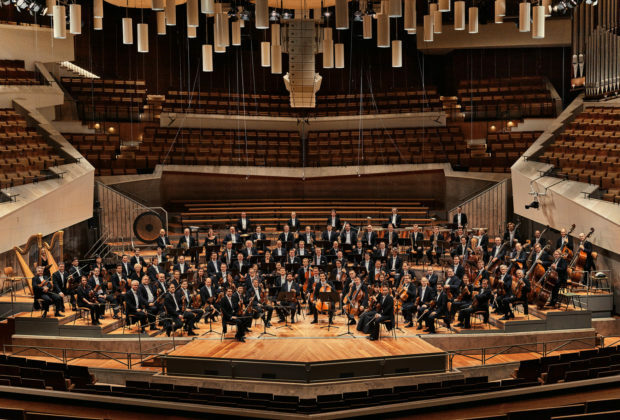 The Berliner Philharmoniker Foundation is generously supported by its principal sponsor, Deutsche Bank. In 2009, the Digital Concert Hall video platform was launched, which broadcasts the orchestra’s concerts live over the Internet. In 2014, the Berliner Philharmoniker founded their own label, Berliner Philharmoniker Recordings. During an orchestra assembly on 21 June 2015 Kirill Petrenko was elected by a large majority of the members of the Berliner Philharmoniker as the chief conductor designated, succeeding Sir Simon Rattle. He will take up his position beginning with the 2019/2020 season.